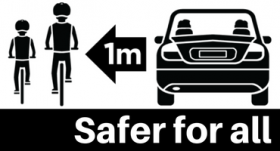 Given recent news items, we feel it timely to remind and reinforce the facts about cycling two abreast. a group of cyclists two abreast have a more visible presence than a longer single file line on a road. it makes it easier and quicker for drivers to slow down and pass when safe. These safety reasons are why riding two abreast is the law. Tip for cyclists: when riding two abreast, consider other road users and if necessary, change to single file to help drivers pass safely. Tip for drivers: only pass when it is safe and legal to do so. After passing, make sure you’re well clear of the cyclists before moving back. WATCH: the video below provides the perfect illustration about why cyclists ride two abreast.